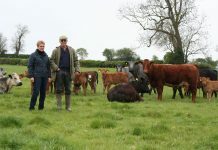 The Northumberland-based Hunter Family credit the Limousin with helping them to maximise the value of the store calves they sell throughout the year. Farming really is a family affair for the Hunters, of Bellingham, but they do not enjoy the luxury of having their land ring-fenced. The Steel is an 800-acre holding, where Andrew Hunter is a third generation tenant and farms alongside his parents John & Doreen. 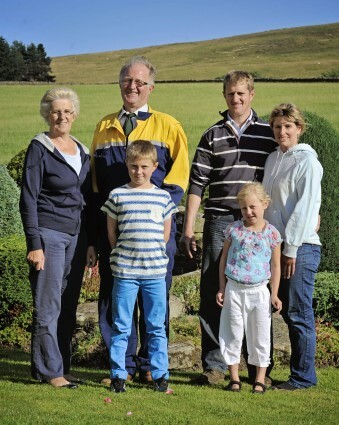 Andrew and his wife, Caroline, also run Caroline’s rented family farm in partnership with her mother, Margaret Armstrong. 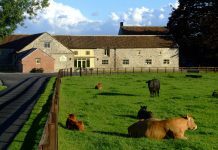 Carrick Farm covers 1,200 acres and there are a further 255 acres which are in ownership. One full-time and one part-time worker are employed across the units. 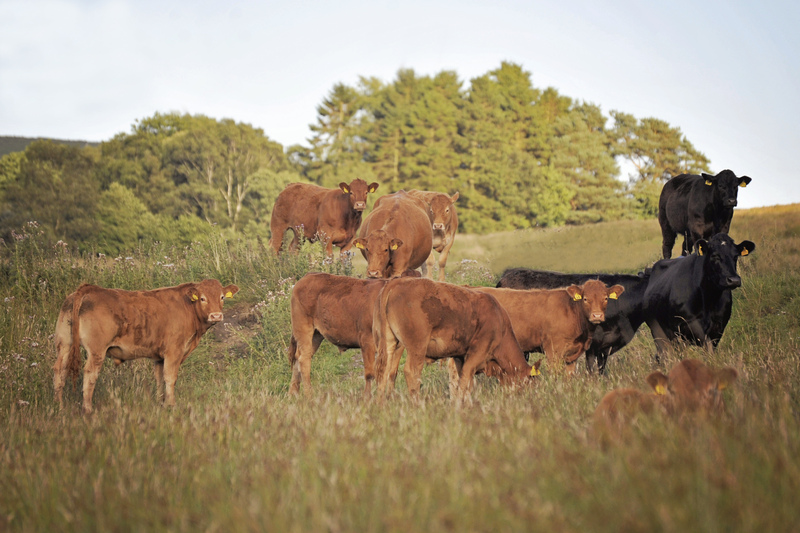 Limousin bulls are used exclusively across all the cows, which are run in two groups. The main herd is made up of 115 Limousin-crosses, for store calf production, while a smaller group of Angus-cross cows is used to breed replacement females. In addition, the land carries more than 1,400 ewes, including a flock of Blackface females. The sale of Mule gimmer lambs for breeding makes a significant contribution towards income. The all-grass farm is in a high rainfall area, where winters are long and some of the grazing land stretches up to 1,000 feet above sea-level. Andrew comments that if it were not for having the cattle to eat down the rough grasses, the family would struggle to carry sheep in any significant numbers. Historically, the farm supported a herd of Simmental cattle, but the Hunters have not considered using any other breed, since the first Limousin bull, which cost just 1,700gns, arrived at the farm back in 1980. The additional value this bull put onto his calves meant the investment paid for itself after just one crop, says Andrew. Another stock bull which has proved his worth is Sarkley Unilever, a Jockey son purchased at Carlisle for 5,800gns, having been put forward by EH Pennie & Son, Powys. This bull has sired around 50 breeding females, all of which score highly on feet and udders. Two other animals of note are Homebyres-bred, one by Sympa and the other by Oxygene. Last October at the annual Limousin Day held at Hexham Auction Mart, 49 store calves by these two sires averaged £1,099. Calves from this batch also won the cup for the Best Group of Four, averaging £1,200. The March 2010-born Plumtree Filbert, bred by Paul Cairns, Notts has also performed well within the herd. The Hunters paid 14,000gns for the Cloughead Umpire son, which is the highest price they have ever paid for a bull. Filbert is full brother to Plumtree Deus, which sold for 35,000gns in February 2010. Ease of calving is a top priority when selecting breeding stock. Andrew is rightly proud of the fact that there has been no veterinary intervention required out of around 500 calvings related to the three current stock bulls. This he puts down to the Limousin as a breed and the careful study of cow families. “I like to look at EBVs when I am choosing a bull, particularly calving ease and growth rates, but they are not the only consideration,” explains Andrew. “My kind of bull has shape and power, but not too much bone. He also has to have a bit of class and a small, sweet head. I would say that the French-bred type suits our system best. The herd is split into spring and autumn calving groups, a policy which is designed to spread “bull power,” as Andrew describes it. Both groups calve inside on straw, the price of which is causing concern to the family. A slatted system is not a viable option, due to the potential difficulties associated with spreading slurry. Andrew mentions that his vet has told him that black commercial Limousin cows are some of the most fertile animals within his practice and he would agree with this view. 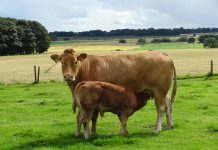 Heifers are usually bulled at 19-20 months; an experiment to calve them slightly earlier was thought to have an adverse effect on longevity. The durability of females is also regarded as an important trait: the oldest cow is about 15 years old, with most females going on to produce 8-10 calves over a lifetime. 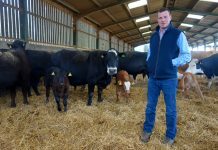 Like other cattle producers, Andrew is keen to maintain a high herd health status and a programme to address this aim has been put in place, with advice from the farm vet. The cattle are vaccinated against BVD and leptospirosis on a regular basis. Autumn calving cows require higher inputs and receive a total mixed ration made up of silage, straw and fodder beet, while the diet for the spring calvers is based on silage and straw. One cut of clamp silage is generally taken from around 200 acres of the best land, although 14 acres had to be abandoned last July because of the unusually wet weather for the time of year, says Andrew. Both groups of calves receive some creep feed, with autumn-born calves weaned at the beginning of August, depending on the weather. Spring calves are generally weaned around Christmas time. While the family sell lambs on the deadweight system, their loyalty to Hexham Mart for the sale of their store calves is unwavering. 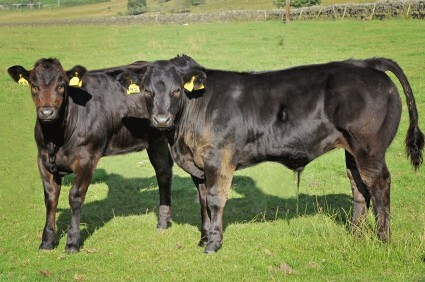 Peak selling times occur during October, December and February, with finishers regularly turning up to bid for the Hunters’ cattle, many of which end up being purchased by private butchers. The cattle are not weighed, but the best bullocks will generally reach around 500kgs at 11-13 months old. Andrew considers Hexham to be the best auction mart for store cattle in the country. Turnout at the farm is not normally possible until May, and Andrew knows that he is not alone in believing that the poor weather conditions – both in 2012 and during this year – have taken their toll on soil structure, with a knock-on effect on grazed grass and silage quality. He believes it will take some time before the land recovers. Andrew credits his father for the tremendous amount of work that he has put into pasture improvement and reckons the farm can now carry twice the number of livestock, as a result of his efforts over the years. As well as reclaiming some of the fell, John has also put up several large buildings to match the gradual increase in stocking rates. By coincidence, the land at The Steel and on Caroline’s family farm is used for military-type exercises. This means that livestock have to be removed from certain areas of the fells throughout the year. Advanced warning of this type of activity is given in good time, and the family is so used to this procedure that it is of little concern. “Our farm is focused on the production of commercial cattle, but I would not rule out the possibility of registering a few pedigree calves at some point in the future. I take a keen interest in Limousin Society sales and in Limousin breeding in general. “However at present, we have more pressing concerns particularly the rising cost of inputs. The returns we are seeing have improved, but the rise in price needs to be maintained if we are to continue making a profit,” says Andrew. 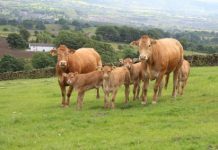 Whatever the future holds, the family is completely committed to the Limousin as the number one choice of sire for their cows.